GIVE is Clarendon Second Community direct donation program! THE GIVE SITE accepts ALL credit cards! Put your check or cash in an envelope, indicate your classroom(s) and drop it in the safe in Room 6. Did you know many companies will match your gift to Clarendon Second Community? Clarendon Second Community is one of the best elementary schools in San Francisco! What makes us so special? Incredible teachers and administrative staff, great kids and families, of course, among so many other things. We also offer our students what the SFUSD does not: Physical Education, Art, Italian, Music and Computer classes. One of Second Community parents’ most important roles here is to raise money for all of these amazing extra classes and rich learning experiences. 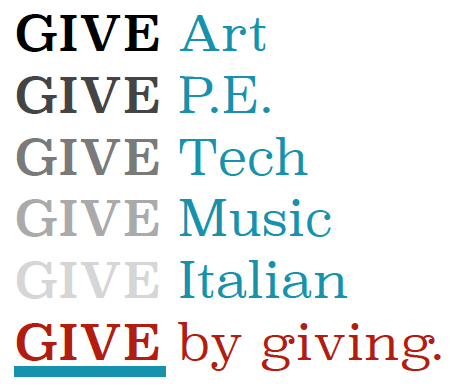 Without our fundraising efforts, enrichment programs would not be possible. What is GIVE? GIVE is our direct donation program. Yup, that’s right, just write a check, bring us your jar of pennies, give us your dime collection. We’ll take anything. Just think, 100% of your contribution goes directly to Clarendon. It’s easy, quick, and fun to do. We will send out a solicitation letter 4 times a year and you just fill out the form, write a check, put them both in the attached envelope and drop it off in the Room 6 safe. We’ll remind you about it a lot, too. We’d like to make this as easy as possible for all families to participate. You can make payments quarterly, once a year or monthly. We can accommodate any contribution you can make, however you’d like to make it. Involve your children – put even just a dime a day into a jar, add it up every month and send it to GIVE. Ask employers, friends and relatives to match (or exceed!) your contributions. How do I participate? We are aiming for 100% participation in the GIVE program – any amounts are welcome! As an example, if you choose to budget a $700 donation over the 9-month academic year, your monthly GIVE contribution will be just about $78. What a bargain compared to private school tuition! (And it’s tax deductible!) We know that many of us cannot afford to give that much – there is no expectation that every family will be able to make donations of this size, but we really hope you will work Second Community into your family’s budget in some way. Any contribution you make to GIVE will help Second Community reach its ambitious fundraising goal. Again, encourage employers, friends and relatives to contribute on your child’s behalf. Did you know that 65% of Fortune 500 companies and countless others match donations from employees to organizations such as ours? Click below to see if your company will match your donation and to access the appropriate forms, guidelines, or instructions!